Storm is MIXing it up with the Storm Mix Red/Silver! The Storm Mix bowling ball is recommended for any bowler who is need of a spare ball. The urethane coverstock makes the ball capable of being a strike ball on really dry lane conditions. 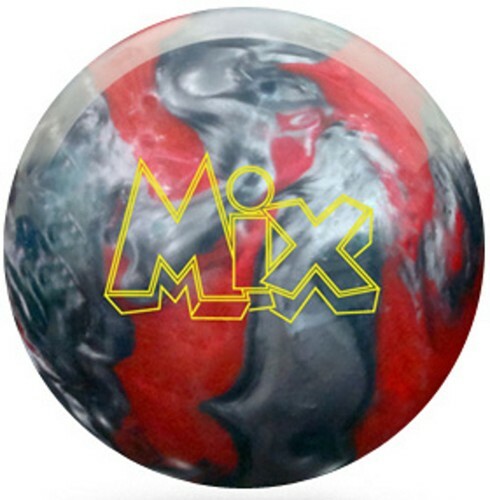 Get the Storm Mix and mix things up a little on the lanes! Bowled at this K of C Tournament twice in the past 3 years. Very dry lanes and needed a ball that would hook less than a Storm Super Natural. Bowled a 200 game with this excellent controlled ball. Will be a great weapon for future tournaments and Senior Olympic bowling. Good for a 13.5 speed in bowling. Ball was $75.00 drilled from the Lansing Pro Shop. I use this ball for dry lanes perfect strike ball hits with good power . Hello! This ball will have very little hook if any at all. Due to the time it takes to produce the Storm Mix Red/Silver ball it will ship in immediately. We cannot ship this ball outside the United States.